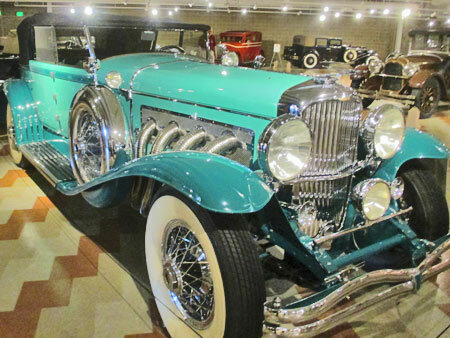 On our recent roadtrip we visited the Auburn Cord Duesenberg Automobile Museum in Auburn, Indiana. 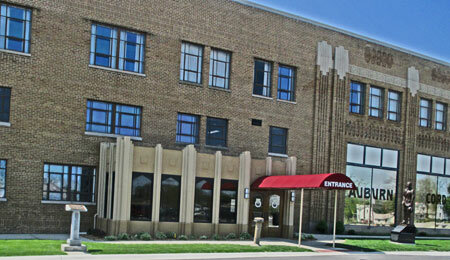 We were first impressed by the Art Deco facade of the original Auburn headquarters building. The deco theme is carried throughout the interior as well, with many art deco features, such as a patterned terrazo floor and diamond shaped door knobs, are preserved. Exterior of the old Auburn Company headerquarters building, now the Museum. 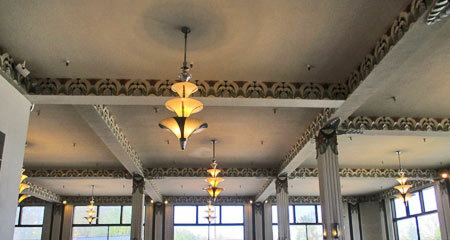 The Art Deco features are well preserved in the interior of the Musuem. We have to admit our bias toward Cord L-29's by showing our favorite car in the museum, the 1930 Cord L-29 restored by Ken Clark in the original black and copper paint scheme. A fabulous car! Our favorite: 1930 Cord L-29. 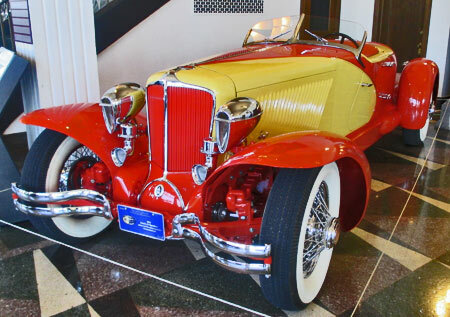 While the museum focuses primarily on Auburn, Cords and Duesenbergs of the Classic Era (1925-1937), a section of the museum is devoted to other classics such as Lincolns, Cadillacs and Packards as well as other Indiana manufactured cars and "Special Interest" cars, that the museum describes as "vehicles that represent the best qualities of Auburns, Cords or Duesenbergs, excelling in luxury, styling, performance or engineering." 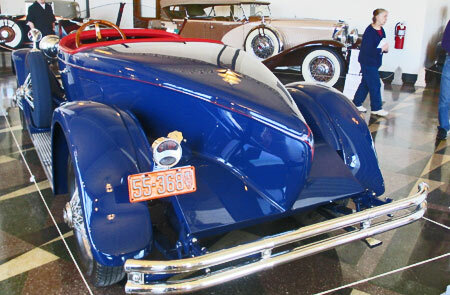 With over 100 gorgeous cars on display cars in this museum, it is difficult to choose what to show here. But we'll give it a go. 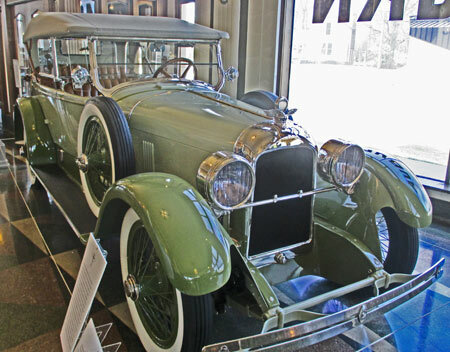 1923 Duesenberg Sport Touring Car equipped with the famous "Straight 8" 260 cubic-inch engine producing 88 horsepower. It is estimated that only 241 were built. Stunning example of a 1930 Duesenberg Model J restored by C.W. '"Bill" Bocock with a 265 hp straight eight engine. 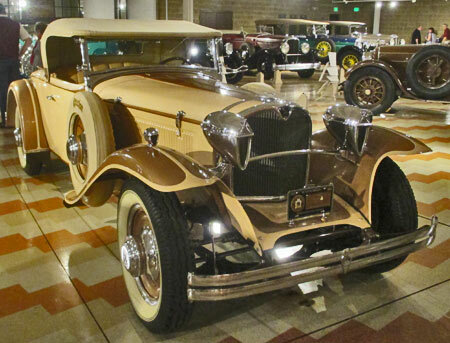 The final example of Murphy Convertible Sedan built by Murphy Company for Duesenberg chassis. 1930 Ruxton, an incredibly rare classic that was a contemporary to the Cord L-29. Compared to the Cord it is lower, lighter and better balanced. To achieve that balance the transmission is divided into two pieces by placing low and reverse gears ahead of the differential, and second and third behind it. Restored by Andrew Adler. Only a handful exist today. One of the more "splashy" Auburns on display in the Museum. One of several "boat tail" Auburns seen at the Museum. 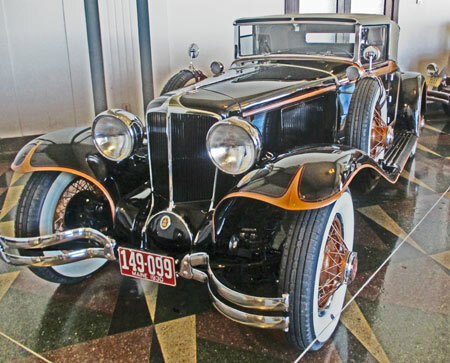 If you have an interest in 1920s-1930s era cars that convey elegance, luxury and beauty, this is a must-see museum. It's a "Duesy!"